Here are some beautiful thoughts from our Holy Father on perhaps the most notable consecrated-virgin saint, St. Agnes of Rome. Interestingly, they were made in the context of an address to diocesan seminarians—read the whole address here. In the martyrdom of Agnes, received courageously in the stadium of Domitian, there shines forever the beauty of belonging to Christ without hesitation, relying on Him. Even today, for anyone who steps into Piazza Navona, (I am very blessed to be able to walk through the Piazza Navona every day on my way to school! I always think of St. Agnes while I am there. It’s a great support to my vocation to be able to be so often in the place where she was martyred.) the effigy of the saint from atop the gable of the church of St. Agnes in Agony, reminds him that our city is based also on the friendship with Christ and witness to his Gospel, of many of its sons and daughters. Their generous surrender to Him and to the good of their brothers is a primary component of the spiritual physiognomy of Rome. 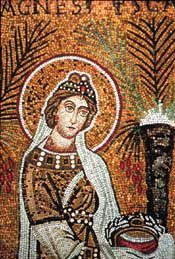 In martyrdom, Agnes also seals the other crucial element of her life, virginity for Christ and for the Church. The total gift of martyrdom is prepared, in fact, by the conscious, free and mature choice of virginity, a witness to the will to belong totally to Christ. If martyrdom is a final heroic act, virginity is the result of a long friendship with Jesus that has matured in the constant hearing of His Word, in the dialogue of prayer, in the Eucharistic encounter. Agnes, still young, learned that being a disciple of the Lord means loving Him by putting all her life at His disposal. (According to St. Ambrose, St. Agnes was twelve years old when she was martyred. And so in my opinion, the life and witness of St. Agnes is itself the most eloquent argument for seeing consecrated virginity as a vocation especially suitable for younger women.) This dual qualification—Virgin and Martyr—calls to mind in our reflection that a credible witness of the faith must be a person who lives for Christ, with Christ and in Christ, transforming their lives according to the higher needs of Grace. Glad to see that you have posted! Have missed your posts. I know you are super busy, but let us know how you are doing. God Bless!